Always struggling with organizing personal and household items? Keep a place for everything, with everything in place! 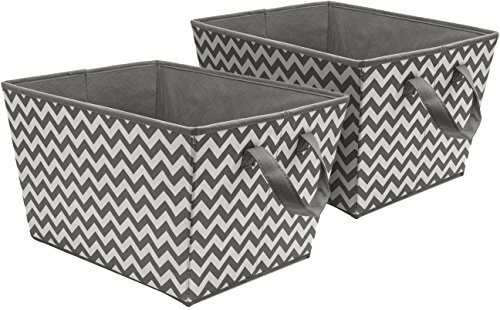 The Sorbus Tapered Storage Bin set features a stylish chevron pattern with two side carry handles and foldable frame. It's ideal for keeping household essentials tidy and organized. Store anything from yarn, magazines, blankets, toys, baby items, and much more. The portable carry handles make it easy to lift and carry from place to place. Tote anywhere from a baby nursery to the living room, or simply keep them by the door to gather everything you need for the car. Versatile storage for any room in the home, office, or dorm. Transform your laundry space with cleverly displayed basket bins filled with dryer sheets and cleaning supplies near the washer and dryer. Organize yarn, knitting needles or fabric scraps for chic a crafty sewing station. In the playroom, create a FUN-ctional play area where Legos, books, and dolls have a cozy basket to call home. Bins are lightweight, sturdy, and easy for kids to place on the floor to grab their favorite toy. For a tidy office, store mail, stationary, and notebooks or complement a common living space with your favorite blankets, books, and gadgets for a cozy night in. The possibilities are endless! A collapsible design assembles in seconds and folds flat for easy storage.